Posted in Bright Ideas / Research on February 15, 2015. Welcome to the Local SEO Industry Survey 2015. This survey, now in its 4th year, is an annual exploration into the Local SEO Industry, looking at both the businesses that operate in the industry & the services that are offered or in demand from local clients. The objective of this survey is to help us gain a better understanding about the evolution of the local search marketing industry & what the mood & outlook is. We hope that by sharing the results with our customers, followers & SEO network, we bring useful insights to help them benchmark their own services and confirm, or even re-define, their own direction. We’d love to hear your own insights & views on the findings so please leave a comment at the end and we’ll reply or publish replies of other readers. This is the 4th year of the survey, having previously published versions in 2011, 2013 & 2014. We promoted the survey to Local SEO professionals throughout November & December, and had a total of 1,973 participants (up from 1,759 in 2014). This year’s survey consists of 20 questions, some of which have been amended from 2014, and some are new this year. We show historical results from 2014, 2013 & 2011 where relevant. 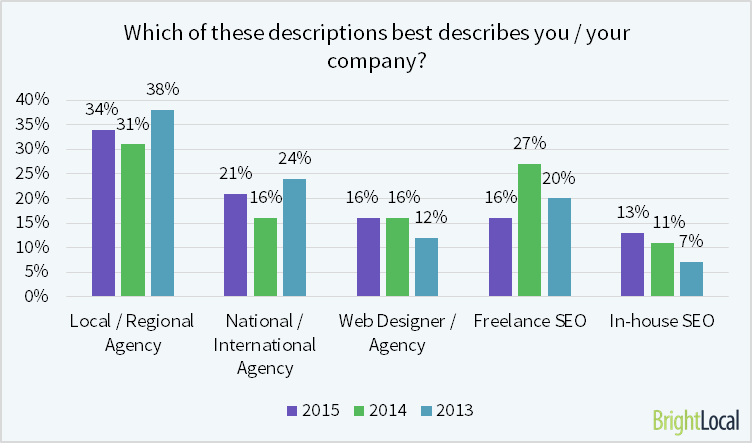 As you’ll see in Chart 1, survey respondents are from a mix of Local Agencies, SEO Freelancers, International Agencies, In-house SEOs & Web Design Agencies. Collecting responses from such a wide pool gives us some fantastic data to compare & contrast, particularly when we are able to deep dive into results broken down by business type & size. As a follow up to this piece we have produced 5 additional reports which breakdown the results by Business Type. Naturally if you’re a Freelance SEO, you want to be able to compare yourself & your services vs. other Freelancers (i.e. your competition). If you want us to receive this report today, then please fill in the details here. So without further ado, let’s get onto the data. Q1. Which of these descriptions best describes you/your company? In this year’s survey we saw a jump in the number of respondents from local agencies (31% to 34%) and a jump in local or international agencies (16% to 21%). 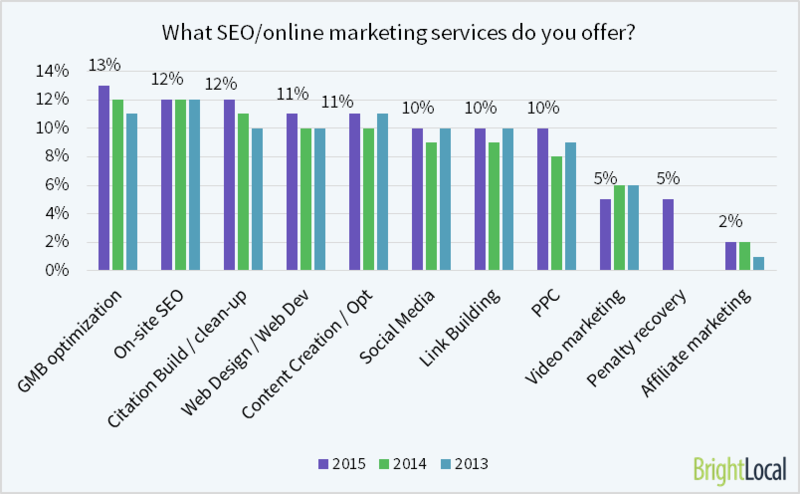 Conversely there was a drop in the number of Freelance SEOs taking part (27% to 16%). Overall we have a good mix of SEOs working in different sizes & types of businesses which gives us some great data for comparison purposes. Q2. How many people in your company are ‘SEOs’? The large majority of respondents reported that they have between 2-5 working SEOs in their company. We know that most respondents are from Local & Regional agencies, and another 29% are working as Freelancers / Web Designers, so it’s not surprising that very few businesses have more than 5 SEOs working in them. Q3.What was your company revenue in the last 12 months? NB. In this year’s survey we extended the options to ‘More than $1 million’ due to a high number of respondents selecting ‘$500k-$1m’ last year. *We calculated the average revenue using the mean value in each revenue bracket – e.g. $200,000 is the mean between $150,000-$250,000. The average revenue for each company is approximated at $363k. And that appears to be up year on year. Fewer respondents said their companies earned <$30,000 (21% down to 15%) while a significant number said they earned over $1 million. 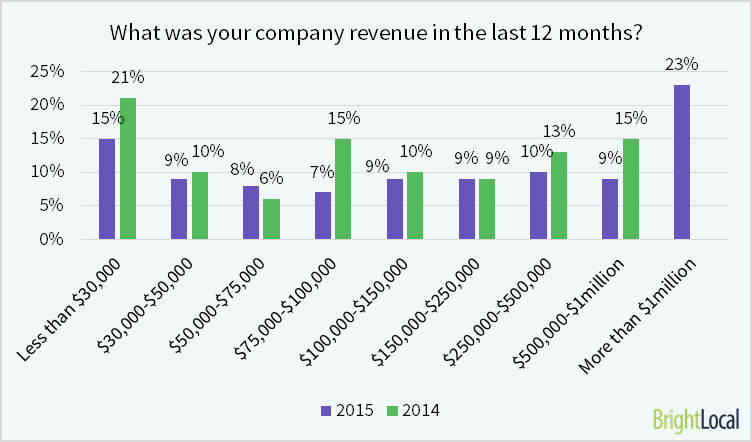 In previous surveys we didn’t include the option of $1 million+ so can’t provide a like-for-like comparison, however it certainly looks like revenue is up for many companies in 2014. That said, part of this shift can be attributed to the drop in freelancers taking part in the survey this year, and more regional & national agencies which will have greater revenues. We suspect that revenue will be closely linked to business type & size so our follow up data that looks at the different business types will shine a closer light on this data point. Q4. How many clients do you personally handle Vs last year? NB. In this year’s survey we extended the options to ’31+’ due to a high number of respondents selecting ’21-30′ last year. Due to the new introduction of ’31+’ as an option this year we can’t directly compare to historic results. However we did ask respondents how many clients they worked with last year – and have presented both results in the chart. 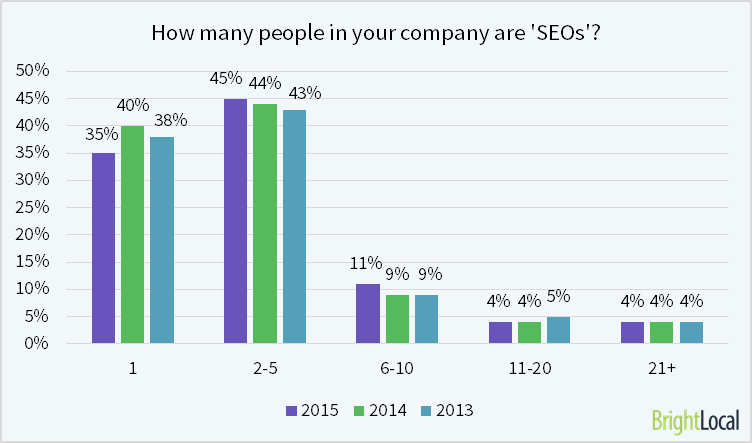 12% of respondents are new to SEO this year and so weren’t handling clients in 2014. It’s great to see the industry still flourishing and attracting new talent to it. We estimate the average at 14 clients, which is quite the handful for most SEOs to deal with. However, this does depend on the SEO services offered, and we look at Services later in this write up. SEOs in 2015 must not only be good at what they do in technical terms, but they must also be highly efficient & process driven to maximise the impact of their time & effort. Is this a sign that SEOs are becoming more overworked and need to take on more clients to make enough revenue? Or does it point to SEOs becoming more efficient and able to simultaneously handle more clients? Or, given the greater number of agency-based SEOs who took part, does it mean that SEOs working in agencies are expected to handle a larger number of clients than freelancers? NB. This question is new to the 2015 survey so there is no year on year comparison. Respondents were given the option to not disclose any data & were removed from the analysis. Income levels look reasonably healthy for the majority of people working in our industry. The median income of 50,000-$60,000 is in-line with similar Industry research done by Moz.com (median SEO income was calculated at $60,215) and is higher than Median individual incomes in the US, Canada & UK (as example countries). Given the complex nature of digital marketing & the impact it can have on a client’s business it’s not surprising that salary levels are wide ranging. We can also see why the industry continues to attract new talent to it. Q6. Which channels are most effective for attracting new customers to your company? NB. Survey respondents were asked to select their top 3 answers. The results are almost the identical year on year, and so it seems that although many things change in the Local SEO industry, the methods of attracting new clients do not. Of the top 4 channels, Word of Mouth, Local Business Groups and Meet-Ups are largely those which depend on reputation & relationships – clearly the route to success. Interestingly, SEO is the only digital channel in the top 4 – the rest are traditional, offline channels. The vast majority of SEOs pro-actively contact less than 10 new leads per month. We estimate the average to be 11/month and the median to be around 3-4 per month. The general picture is that most marketeers are not active in their sales tactics and rely heavily on inbound inquiries generated by Word of Mouth & through local networking. This seems like a sensible approach built on relationships & reputation. A key reason for this could be because SEOs are very busy and don’t have much time for sales – especially if they’re handling 31+ clients. 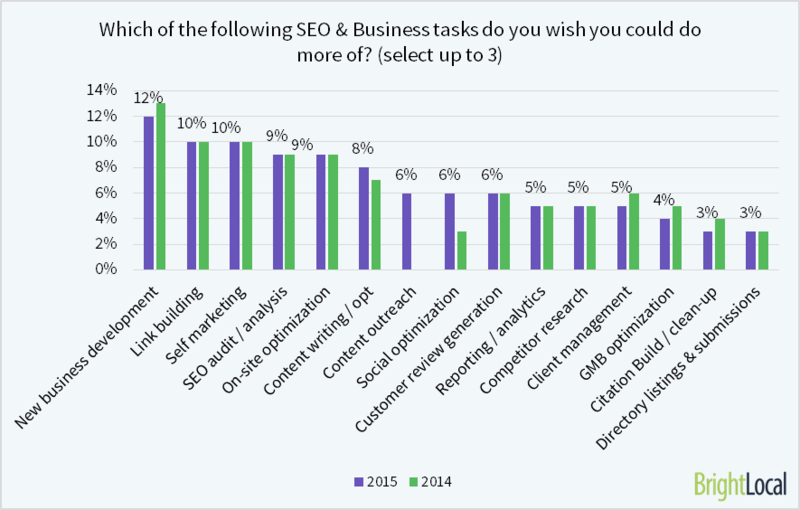 In Q.20 (see chart) we see that the #1 task that SEOs wish they could do more of is ‘New Business Development’. Q8. 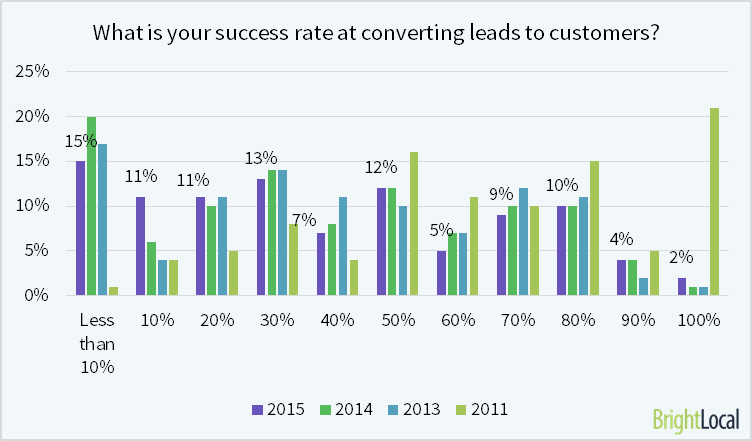 What is your success rate at converting leads to customers? There is a wide spread of conversion rates showing that some SEOs/agencies are much more proficient at sales than others. The results year on year remain consistent so no great change from 2014. We previously polled BrightLocal users about how much time they spend on planning & pitching to SMB clients, and found that 25% of SEOs spend less than 1 hour in planning & pitching to a typical SMB client (with 1-3 locations). Whilst for larger SMBs (3-10 locations), 99% of SEOs will spend more than 1 hour, and 33% will spend between 5-10 hours planning / pitching for a client. So, the size of the client also plays a big part in the process, and you would expect that the time spent on preparation, as well as the agencies / SEOs relative expertise, also plays a huge part in determining success rates. Q9. 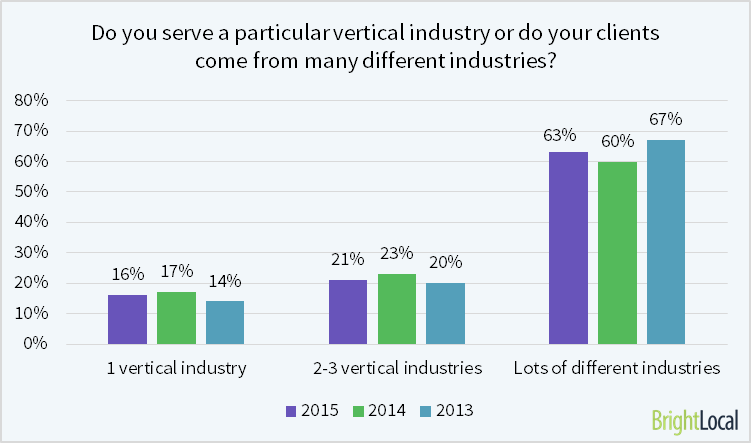 Do you serve a particular vertical industry or do your clients come from many different industries? Most SEO will work with clients from multiple industries, and this probably feeds into the fact that attracting new business can be difficult, as seen by the wide spread of success rates at converting new leads. In fact there is a small but significant decrease in SEOs working within just 1, or 2-3 industries. Ultimately, if a marketing agency or consultant can demonstrate expertise in one industry, then it can be a huge benefit when trying to win new business. However, not all SEOs can afford to have that luxury, and likewise, larger agencies with more resources may be more adept at demonstrating experience & past successes in multiple industries. Q10. What does an average customer pay you each month? 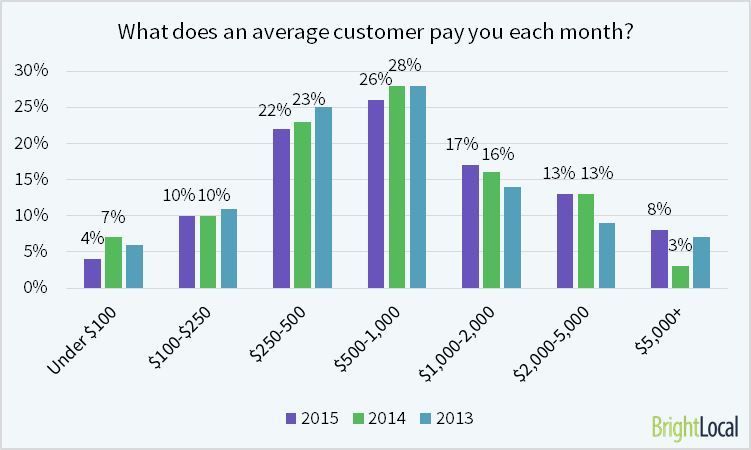 Income per customer is up on 2014, with more customers earning over $1,000/customer per month. With more agencies involved in this year’s survey, the biggest jump is in customers paying $5,000+ (8% up from just 3% in 2014). It’s good to see a drop in the number of clients paying <$100/month. Is there really a place in the market for SEO services at this rate? Can the work delivered be of good quality? 36% of clients pay less than $500/month which is a little surprising given the revenue & income figures we saw earlier in the survey. But with many clients only prepared to pay $500/month it’s not surprising that SEOs need to take on a high number of them to generate significant income. Q11. Do you expect to grow your business in next 12 months? Largely, the outlook is very positive with almost 9/10 SEOs ‘definitely’ expecting to grow their business in the next 12 months. At 89%, confidence is softer than in previous years (93% in 2014 & 2013) but the general outlook is still positive with excellent potential for growth. Q12. 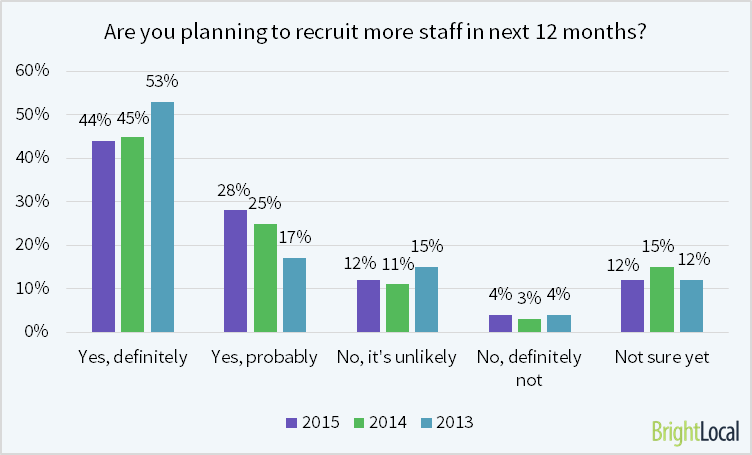 Are you planning to recruit more staff in next 12 months? Again we see signs of a positive outlook in the Local SEO industry, with many marketing agencies & consultants looking to recruit new staff in the next 12 months. We already saw that 12% of survey respondents were completely new to Local SEO last year, and on the basis we expect that trend to continue into 2016. Q13. 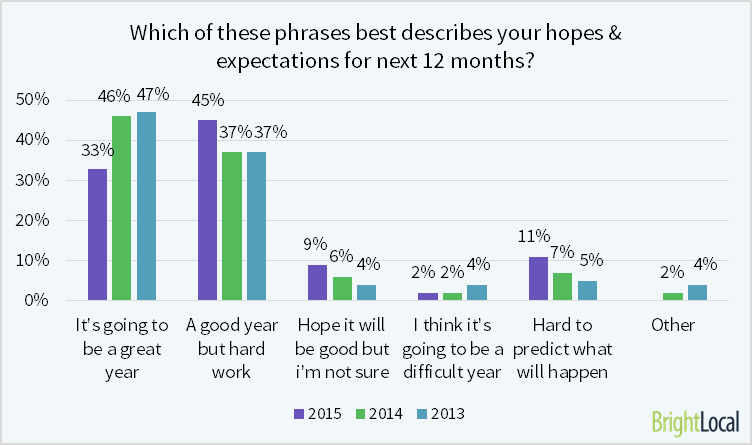 Which of these phrases best describes your hopes & expectations for next 12 months? Despite 89% of businesses expecting to grow in 2016, the sentiment is not as positive as in recent years. A greater number of SEOs/Agencies are less confident about the success they’ll achieve and expect it to be harder work. We are in an industry in permanent flux and under pressure from many fronts. This makes it hard to predict what will happen and requires us to be vigilant and responsive at all times. So while the general outlook is positive and revenues & incomes are relatively high, these don’t come without their share of trials & challenges which make us wary of the future. Small, local, or multi-location businesses will always need to have a web presence, and be able to get found online – so an SEOs daily tasks may change but the need for our skills & services won’t die out any day soon. This set of questions relates to the SEO & marketing services you provide, how they perform for your customers and which ones you enjoy or dislike having to do! Q14. What SEO/online marketing services do you offer? NB. Respondents were asked to select as many answers as they want. Also, “Google Penalty Recovery” was a new answer for 2015. What a wide ranging set of SEO / Online Marketing services on offer! There’s not a huge difference year on year, with PPC accounting for the largest increase (just 2%). With the average SEO handling 14 clients, it’s not hard to see how workloads can be difficult to handle. Q15. 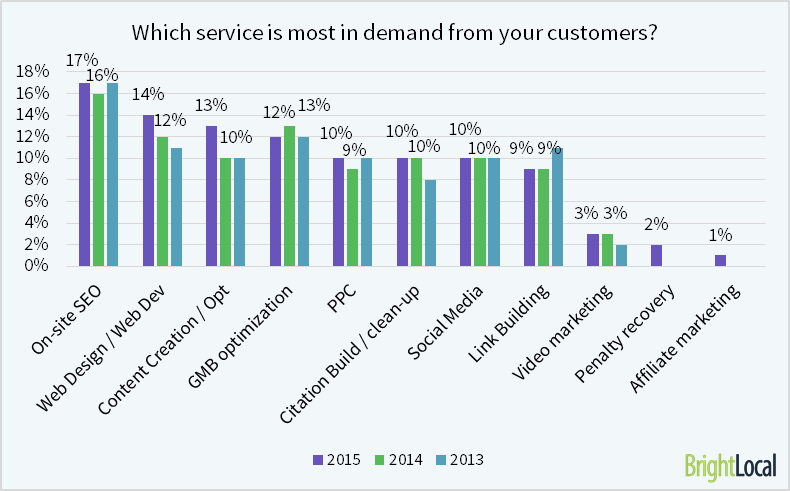 Which service is most in demand from your customers? The Local SEO services offered generally match those which are most in demand. Those which have seen the largest demand increase year on year, are Content creation / optimization (+3%), and Web design / development (+2%). It’s unsurprising that Content creation & optimization has seen a jump. Businesses of all sizes are adopting a content-first approach as a way of building long term authority in their topic areas. Q16. How much of your work do you outsource to 3rd parties & white-label SEOs? There’s a notable decrease in the amount of work that SEOs are outsourcing year on year, and 31% of SEOs do not outsource any of their work (vs 25% in 2014). SEOs are handling more clients year on year, and are taking on a wide range of tasks, so a certain amount of outsourcing would be understandable. However, with 72% of Agencies / Consultants planning to recruit more staff in 2016, perhaps the focus is much more about keeping it in-house and retaining control on the quality of work delivered. Q17. Do you believe that Social Media is an effective marketing channel for local businesses? Belief in the power of social media for local businesses has dipped a little since 2014. Less SEOs believe that it is ‘very powerful’, whilst more SEOs believe that it works for ‘some businesses’. However there are now less SEOs that think social media is ‘over-hyped’ (3%), and that figure has steadily declined since 2011 (11%). Only 1% of SEOs are adamant that social media does not work for local businesses. Different businesses get different level of results from social media. This is as much a product of the type of business they are as the degree to which they engage with it and bake it into their everyday processes. In April 2015 we hosted a webinar entitled Social Strategies that Really Generate New Customers. Our expert panelists gave great tips & insights to what REALLY works well for their local customers – it’s a must-watch so please check it out. Q18. 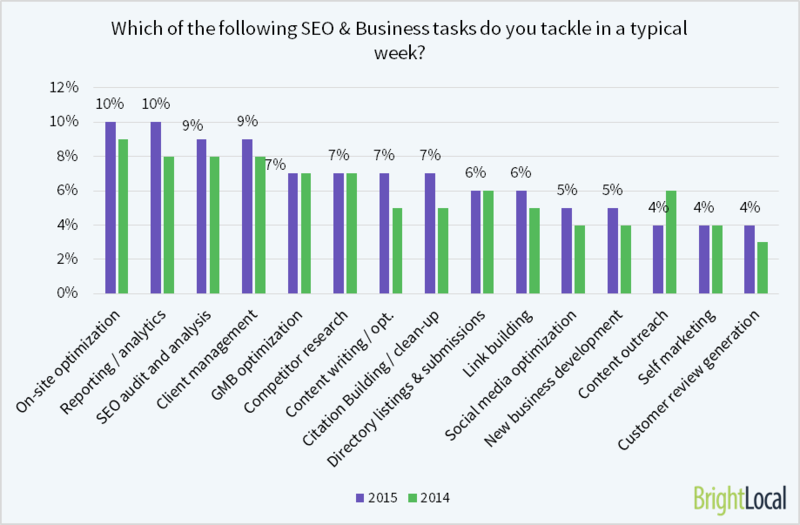 Which of the following SEO & Business tasks do you tackle in a typical week? The chart really helps to reaffirm the varied & complicated tasks that an average SEO has to handle on a weekly basis. This is another question whereby, in different sized agencies & business, we would expect to receive quite different responses. For a freelance SEO for example, we would expect that the range of tasks would be larger due to the fact that there is only one SEO working on the tasks. In larger agencies you expect more specialisation with different tasks being syphoned off to be a handled by different departments or ‘specialists’. Q19. Which of the following SEO & Business tasks do you find to be the most time-consuming and tedious? Since we’ve ran the Local SEO Industry Survey in 2011, Link Building has been consistently hailed as the most tedious & time consuming task for SEOs. To de-clutter the chart we won’t show the 2011 & 2013 data, but here are the scores given to Link Building since 2011. Since 2013 the perceived ‘tediousness’ of Link Building has dropped significantly. Is that because some SEOs have stopped doing / changed strategies in the wake of Google penalties? Perhaps now that the industry perception has shifted from ‘gaining’ or ‘building’ links to ‘earning’ them, much of the tedious work has gone out of the process. Q20. Which of the following SEO & Business tasks do you wish you could do more of? Link building is seen as a tedious task yet one that SEOs still wish they could do more of. Links make up 20% of the overall Local Ranking Factors, and are still critical for Local Ranking. New business development goes hand in hand with internal growth & staff recruitment, which most SEOs are planning to do in the next 12 months. However, given the sheer work-load undertaken by SEOs there is often little time left for focusing on winning new business – particularly when the success rates at converting new leads vary so so wildly. It’s the catch 22 for growing from a 1 man consultancy into a larger agency! Fill out this quick form to receive an email with instructions on how to download your company type report.